A slick, shiny turd came out of this package, but I guess I shouldn't be surprised. 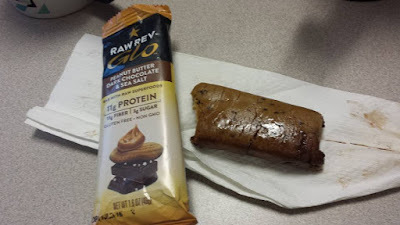 There's a turd-shaped dollop of peanut butter depicted on the wrapper, warning you of what's inside. Once I got over the initial visual revulsion, it actually tasted good. The texture is slightly grainy/sandy in the way that most peanut butter based bars are, but it's hard to go wrong with PB & chocolate.